The B.K. Kee Foundation is a family foundation dedicated to the development of vulnerable communities in and around Myanmar. The Foundation was founded in December, 2005, by Dr. Lay Khin Kay in memory of her mother, Kee Beng Kung (B.K. Kee). The Foundation typically makes small, strategic grants to community based organizations in the health and education sectors. The Foundation also operates a community based health clinic in South Dagon. Patients awaiting doctor consultation at the B.K. Kee Community Clinic in South Dagon, Yangon. The clinic provides prenatal and antenatal care, vitamin supplements, health trainings, vaccinations and tuberculosis care to a poor community on the outskirts of Yangon. Dr. Lay Khin Kay and Stan Sze visiting the high school in the Ei Thu Hta Refugee Camp with our partner, KSEAG. Har Htoo came with his mother to our partner, the Burma Children Medical Fund, to seek treatment from hydrocephalus. Our partner, the Karen Women’s Organization, educates over 400 students with disabilities in the refugee camps. Hand washing training and education for the community and health workers at the B.K. Kee Community Clinic. 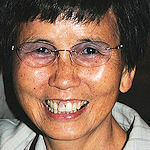 Dr. Lay Khin Kay, the founder of the B.K. Kee Foundation, visiting the B.K. Kee Community Clinic in January 2014. When natural disasters strike, we have provided financial support and direct relief to affected communities such as those flooded in 2015 and destroyed during Cyclone Nargis in 2008. Here, villagers at Py Taw Thar in the Delta await supply distribution. We are proud to support Dr. Cynthia Maung and the Mae Tao Clinic by funding the waste water treatment system at the new Mae Tao Clinic. Since 2007, we have partnered with Thabyay Education Foundation, to provide scholarships to students from Myanmar to study at colleges and universities abroad. Our grantee, point B Design and Training, is employing design thinking and nurturing creativity to help young, promising Myanmar students to tackle and solve intractable problems in their own communities. Our long-time partner, the Karen State Education Assistance Group, distributes school supplies, teacher subsidies and other education assistance, to 161,253 students, 8,309 teachers and 1,502 schools in Eastern Myanmar. Identifying and concentrating on needs and projects that have historically not been the focus of other charities and organizations. The Foundation prefers to provide seed money for programs with a clearly articulated plan for continuing its mission without indefinite financial support from the Foundation. The B.K. Kee Foundation has been a supporter of CPI since it was known as the Global Health Access Program (GHAP). We share a common vision and often collaborate to serve the myriad health needs of some of the most vulnerable communities in Myanmar. Saw Myo Min Thu (Saw Kapi) is the Executive Director of our partner Thabyay Education Foundation. After working in the higher education sector in the U.S. for more than twelve years, he returned to Myanmar in February 2014 to lead Thabyay, one of Myanmar's leading civil society organizations and a long-time grantee of the B.K. Kee Foundation.